LONDON, England (CNN) -- Hollywood star Will Smith led a London crowd of 46,664 in a chorus of "Happy Birthday" to Nelson Mandela on Friday at a party for the South African prisoner, president and Nobel Peace Prize winner. Nelson Mandela had a smile and a message. 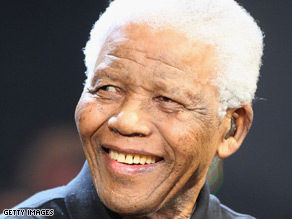 Smith introduced Mandela to the London crowd celebrating Mandela's life with the words "The one, the only, the birthday boy, Nelson Mandela, Nelson Mandelaaaaaaaaaa." London was the scene of a concert 20 years ago to celebrate Mandela's 70th and to raise awareness of his imprisonment. Mandela told cheering fans, "Your voices carried across the water to inspire us in our prison cells far away. Tonight, we can stand before you free. "We are honored to be back in London for this wonderful occasion. "But even as we celebrate, let us remind ourselves that our work is far from complete. As Mandela walked on stage, Smith led the crowd in a chorus of "Happy Birthday." Proceeds from the concert in London's Hyde Park will go toward the 46664 Campaign, which Mandela founded in 2003 to raise awareness about the impact of AIDS, especially in Africa, and to promote HIV-prevention measures around the world. The name of the charity represents Mandela's prison number when he was incarcerated at Robben Island. Organizers put 46,664 tickets up for sale. Dammers was also one of the driving forces behind the London concert in 1988 to awareness of Mandela's long imprisonment by the South African authorities. Speculation surrounded whether Winehouse would perform after being hospitalized with lung problems last week. More than a dozen African artists, including Johnny Clegg and the Soweto Gospel Choir, performed. Smith, music legend Quincy Jones and Formula One driver Lewis Hamilton were among the stars introducing acts. Other guests at the concert included British Prime Minister Gordon Brown, former U.S. President Clinton, talk show host Oprah Winfrey and actor Robert De Niro. Mandela served as his country's first democratically elected president from 1994 to 1999. In recent years, he has campaigned on behalf of HIV and AIDS awareness and has long called the battle against AIDS a basic human right. In 1964, a court sentenced Mandela to life in prison for plotting to overthrow the government by violence. He spent the first 18 years at Robben Island Prison, off Cape Town, South Africa, and later spent time at Pollsmoor prison and Victor Verster Prison, closer to the mainland. While in prison, Mandela became recognized as the most significant black leader in South Africa, and he became a potent symbol of resistance in the anti-apartheid movement. Mandela consistently refused to compromise his political position to obtain his freedom. South African President F.W. de Klerk released Mandela in February 1990 after 27 years in prison. Mandela was elected president of the African National Congress the following year, and in 1994, he was elected president of his country.